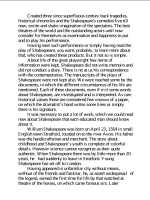 literature and the world's pre-eminent dramatist. doubtful. But some facts are known to us and are proved by documents. farmer in the village of Wilmcote. of a popular acting company. a fine old church in Stratford. 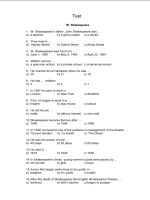 romances, and collaborated with other playwrights. were included in the First Folio. also belong to Shakespeare's earliest period. represent the peak of his art. with forgiveness of potentially tragic errors. Shakespearean verse drama, though with little success. his theories of human nature. Shakespeare died on 23 April 1616.
their versions of this question. diverse cultural and political contexts throughout the world. 2. Цветкова И. В. и др. поступающих в ВУЗы. Устный экзамен. – М.:ГЛОССА-ПРЕСС, 2004 г.
издание: выпуск № 5, 2008 г.